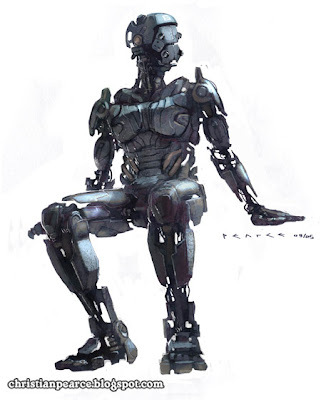 Christian Pearce: Art for Ted Chiang's "The Lifecycle of Software Objects" - part three! Art for Ted Chiang's "The Lifecycle of Software Objects" - part three! Here's a few of the robot designs and painting styles I went through. Ted saw an old robot I had drawn (the blue one sitting at the bottom) and that ended up being the basis for the robot in the book. These ones were all pencil sketches coloured up in photoshop but for the watercolour look we settled on I used Artrage, I'll tell you about my struggles with that in a minute! Awesome stuff CP! love that bottom one. ah man, beautiful work. the seated robot is amazing! Geez man! That sitting fellah is damn cool! When the world gets taken over by robots, I hope the robots will be designed by you! The transition to robot rule will go so much more smoothly and coolly.